I'm a bit late getting this post as this past week has been, um, interesting. I had to take hubby to E.R. last Thursday and Saturday. He had the flu and possibly a viral pneumonia on Thursday then chest tightness on Saturday which they determined to be from all the coughing. Last Wednesday I had to go get my eyes dilated and scanned as my pupils are super tiny and VERY difficult to dilate, yep, Retina Assoc. got 'r done. We were supposed to go to my cousin's funeral on Friday but with hubby having the flu we stayed home and I kept a close eye on him. My brother and SIL were here for the funeral but we did finally spend some time with them Easter Sunday at dinner as Dean was feeling quite a bit better and all the meds were really kicking in. Worked Monday, took Dad's 2 kittens to the vet yesterday, and today, my Honda got all the recall items replaced. Oh my! I'm glad this past week is over! 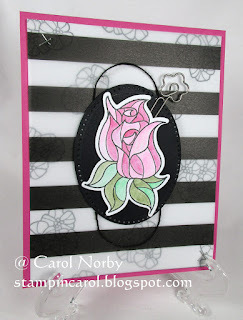 So, no stamping but I still have 2 of the 4 cards for my upcoming April 28 class called "Love for the Ladies". Since the majority of my students are retired most of their moms have passed, as has mine, this is not a Mother's Day class but I will have a Mom's Day stamp available should they want to use it.. So, are you ready? I started with a base of Watermelon Fusion card stock. 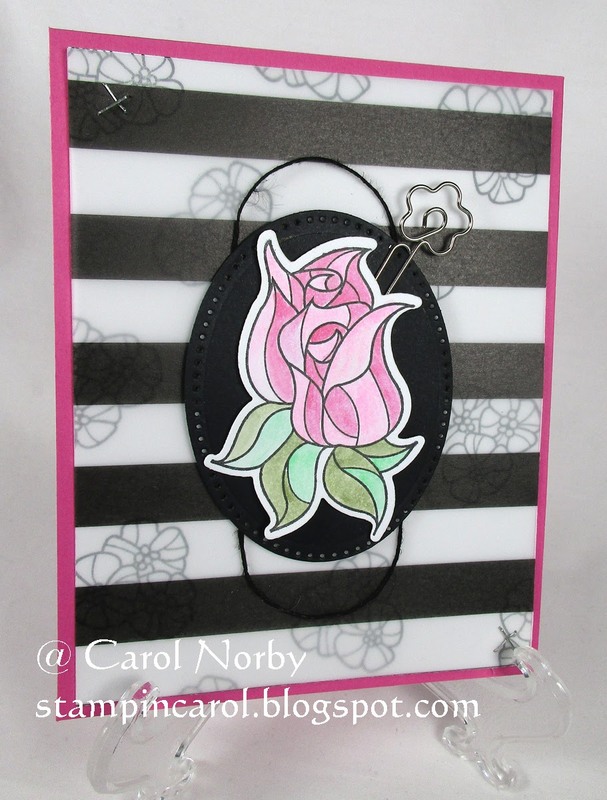 I stamped the Whip Cream card stock layer with the small flower group from the Glass Blooms Bundle stamp set and added a same size layer of the black striped vellum from the Vellum Designer Prints pack using our Stapler and Brushed Silver staples. 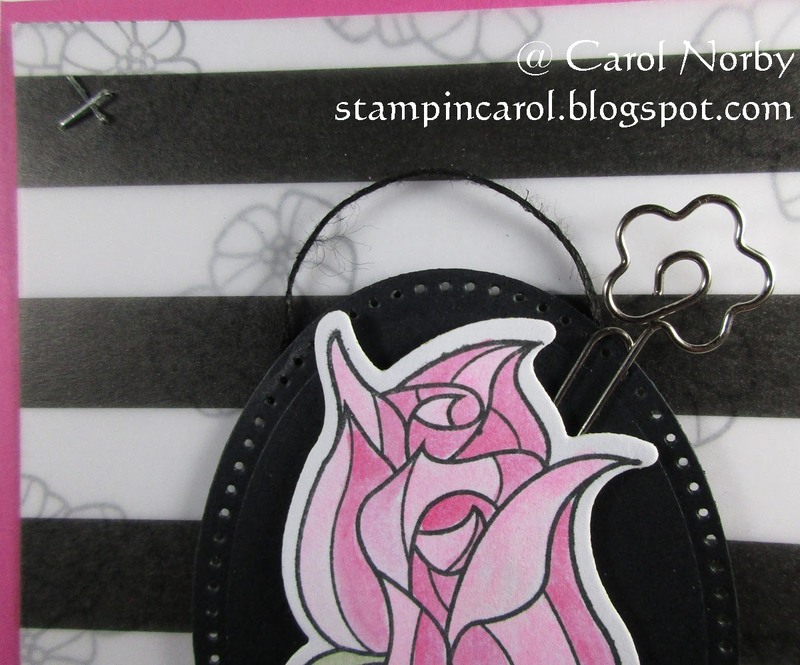 I die cut the Black Licorice card stock using our Journey Ovals dies and, using Foam Squares, adhered it over a loop of Black Licorice thread. I stamped the Tulips on Whip Cream and colored with our Color Burst Pencils then die cut. I adhered to the oval using our Foam squares. 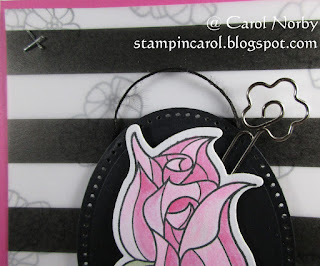 I added a floral clip from our Fun Day Elements for fun. Oh, all stamping was done with Black Licorice ink. I deliberately did not stamp a phrase on the card front. I hope tomorrow I can play with some of the new stamps from our current Spring Into Summer mini. Have you checked it out? Just click on it in the sidebar! And remember, about May 10 Fun Stampers Journey will be changing servers so all my links to the products I'm giving now will be incorrect once the change is made. All products will then have new links.